G.C. Madoc: "The last month of 1956 brought a total of 41 eliminations of terrorists, which is average for the year...During the year, 287 terrorists were killed, 52 were captured and 134 surrendered. The [communist] politburo policy of avoiding contacts and conserving terrorist strength remains in force." Casualty tables, December 1956: "Ranking terrorists eliminated – 8." "In Selangor a small but important success was achieved when the whole of the Ampang branch, on the outskirts of Kuala Lumpur, was eliminated." 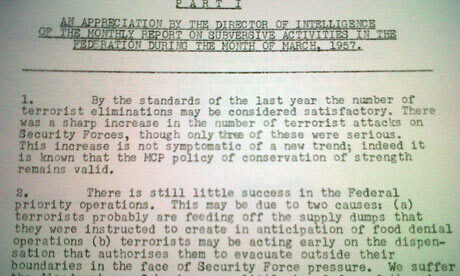 In March 1957: "By the standards of the last year the number of terrorist eliminations may be considered satisfactory." The killing of Tan Fuk Leong: "by aerial bombardment, may presently ease the situation in North Negri Sembilan [sic]." "His inspiring leadership of the 3rd Independent Platoon has been a major factor in the preservation of MCP influence in the north of the state. We know from experience that the elimination of senior leaders has little apparent effect on the morale of followers, but the plain fact is that only one deputy platoon commander survives." A "secret and personal letter", March 1953 by Sir Thomas Lloyd, permanent undersecretary at the Colonial Office. "The growth of anti-colonial activity is a feature of the general world situation with which we have to reckon these days. The dangers for us from it are sufficiently obvious, not least because its use to smooth the way for communist strategy in colonial territories … It may only be a matter of time before members of the Arab/Asian bloc will cause [their] agents to interest themselves to our detriment in the underground political affairs of our territories."